Is Hard Copy Media Dying Out? Looking at industry sales figures, there seems to be one thing it’s safe to conclude: digital distribution isn’t going anywhere. More and more, consumers are turning to electronic copies of media they once plucked from shelves. With the burgeoning popularity of the iPad and other tablets, e-readers such as the Kindle and Nook, and the wide array of smartphones on offer today, we are constantly being provided with new, modern and exciting methods of consuming media. Today, most major magazines and publications now have online editions available for download (with some actually charging for this service, just as they do with hard paper copies) and most novels are available in formats for making them accessible on tablets, e-readers and smartphones. And yet, despite this recent leaning towards digital media, many supporters of traditional print media would argue trenchantly that, regardless of this rapid development and growth in the digital arena, electronic media has not, will not fill the shoes of the hard copy. Why is print media suffering? In today’s world, where we expect everything to be instantaneous and where we expect products to be at our doors the next day, the print media is slower and less convenient than digital media and this is just one of the reasons why so many people are turning digital for their written word. With print media, we have to make a physical purchase – we must visit a shop, take money with us, look through book shelves and find the book / magazine / newspaper we’re after. With digital we can set automatic downloads, we can read on the go, we can store our books in a compact piece of technology (instead of a bulky book), we can purchase multiple items within minutes and we can save our credit card details for easy recurrent payment. With perks like this to outweigh the tradition print media, what (if anything) is keeping the traditional print media alive? Many people who have grown up with traditional print media are adamant not to change – are most likely the people keeping the print industry alive and kicking. As much as sales may have dropped in print media and many digital industry specialists will argue that the print industry is slowly dying, there are just as many who will argue that the print industry will remain strong so long as people keep investing in books and magazines, etc. Many individuals find it bizarre to imagine a world without hard copies and without book shelves full of old dusting books – replaced instead by a single Kindle upon the bed side table. So what are the key players, if digital does take over print media? 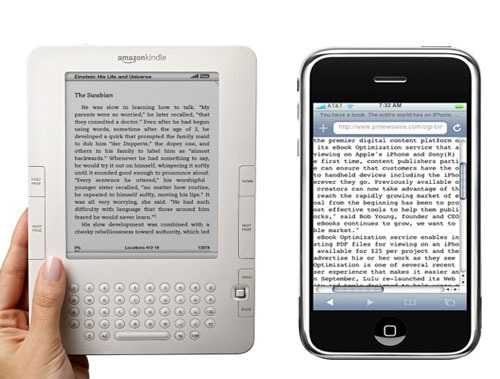 Well of course, as mentioned – the Kindle and other technologies such as the iPhone and iPad are a huge reason for the success and growth of digital copies. The portability and convenience of these items mean that they are great alternative to bigger and bulkier hard copies such as books and newspapers. The internet is also a key player – the internet is a huge online forum for information access and means all information is easier to find, easier to access and easier to share; much easier than searching through a library or bookshop – and much less time consuming. What other reasons might contribute to the decline of print media? Another huge reason the print media may being seeing a steep decline is lack of advertising. Many smaller magazines have had to close or be bought out – simply because advertisers are find more savvy ways of marketing and advertising (and most of this is online). Marketing divisions of companies that previously advertised in print media are seeing great amounts of online traffic, online sales and online publicity on the rise – and so it seems that they think money would be better spent here than in print media which is on the decline.